Liberty I bow is perfect in all categories. Advantages of a heavy arrow. shooting a light arrow at 63 lb. 2) The heavy arrow is also quieter than a light arrow. yardage it does matter as much. 2) It has less arc and you can shoot through brush easier. 3) Less time to be affected by the wind. 5) You can take longer shots with your sights pin set up. 6) Penetration is only slight less and is not a factor. 7) The speed really impresses those watching. 8) It is more fun. between 28” centers. Example a 340 Easton arrow deflects . deflection for the 5.85 gr/in. and shipping costs (if shipped with bow). THE FASTEST ARROW YOU WILL EVER SHOOT! How to calculate how much Kenitic Energy you need. Try getting 170fps out of a 30-35 lb bow. BEST MECHANICAL BROADHEAD 100 gr. deployment in flight and in the quiver. 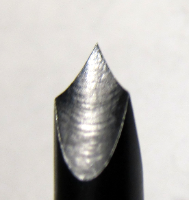 Heat treated stainless steel tip. grains per inch with a weak spine of 400. Shows how to make cut-off saw. energy with wiggle (bending) energy.